A thorough synopsis of L. Frank Baum’s The Wonderful Wizard of Oz (1900) and the script, inspired by the book, of the 1903 Broadway musical-comedy extravaganza. An overview of the plots of prior silent film adaptations of Oz and how they influenced the M-G-M film. An analysis of newly-discovered audio transcriptions of Wizard of Oz radio programs from 1931-32 and 1937-38—all of which were previously unknown. A complete accounting of Sam Goldwyn’s proposed (and aborted) 1934 Technicolor musical version of Oz starring Eddie Cantor (including commentary from Cantor’s sole surviving child). A thorough analysis of the October 10, 1938 M-G-M shooting script (provided by descendants of comedian and Cowardly Lion actor Bert Lahr) that predates the beginning of production by seventy-two hours. Judy Garland’s trials and tribulations with the studio, including the threat that M-G-M was grooming a sound-alike who tested for Oz. The supporting player who was cast in two roles in Oz’s fantasy sequence—the second role revealed for the first time in Scarfone and Stillman’s text. The Munchkin midgets’ pre-1939 Wizard of Oz connection. Oz’s film editor with a direct connection to Walt Disney and Snow White. Studio nepotism, favoritism and politics at the height of Hollywood’s golden age on the making of the world’s most famous film. "The Road to Oz not only delivers exciting, previously unpublished information and insight, but does so in an extremely well-cited format. This is absolutely a must-have for any Oz fan or film historian." "A new and wonderful book penned by the foremost Oz movie history authors. This is a must-read for all old and new Oz fans worldwide." "Numerous books have celebrated the fan appeal of MGM’s Wizard of Oz, but there’s far more to this story than nostalgia. Scarfone and Stillman delve deep into the history of this landmark film, exploring its place in the pantheon of classic fantasy films, as well as fascinating details of production. 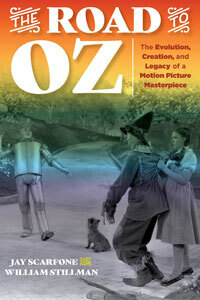 The Road to Oz is an important addition to the film-history bookshelf." "The Road to Oz is a gamechanger in the world of motion picture history books. Long considered the leading authorities on the making of The Wizard of Oz, Scarfone and Stillman have crafted decades of extensive research into a new and unparalleled historical recalling of the classic film."